If he were a Leninist, he would be set not merely on destruction, but on raising the worker to into positions of power to aid in “the revolution.” He would need to be arguing for the establishment of some sort of version of the Vanguard party to counter the Democrats and the Republicans. For if he thinks that the entire system is corrupt and needs to come “crashing down,” then there ought to be an alternative. Yet there is one thing we all know for certain about the Trump administration’s picks for cabinet posts: there is not one working class or even middle-upper class person among them. They are all extremely wealthy and most come from highly capitalist corporations, such as Goldman and Sachs, Exxon, private equity firms and other economic “empires.” Thus it is highly odd, to emplace people in the heads of cabinet posts that would seek to tear down the edifices of power that give them their livelihoods. Indeed, with today’s expected executive order rolling back the Dodd-Frank Wall Street Reform and Consumer Protection Act, the administration is all but inviting back the lecherous behavior of big banks, mortgage lending, and predation that generated the Great Recession, as well as making it easier for bribery and corruption to reign in the halls of government. As Bannon has been the main author behind the executive orders, I see no evidence that he is in any way for the worker. Moreover, if he were a Marxist, he would be supportive of equality between the sexes. As Marx sees it, the inequality between men and women was a product of the bourgeois institution of marriage, which he famously criticizes as nothing more than “a system of wives in common.” What he means is that women are exploited as “mere instruments of production.” Women in bourgeois life are things, not people, and are nothing more than items to be owned, used, and discarded. The owners of the means of production (i.e. women and all workers), can do what they like with their bodies and labor. Thus, if he were a Marxist, Bannon would seek to overturn this state of affairs and institute broad changes embracing equality. However, it appears that Bannon, as Chief Strategist, has not sought to raise women’s status, but to lower it. He has undoubtedly advised the Trump administration in its picks for cabinet posts, including Tom Price for head of Health and Human Services, who has sought to defund Planned Parenthood and increase restrictions on access to women’s health and abortion services. Additionally, with the nomination of Neil Gorsuch to the Supreme Court, the administration has signaled that it wants to challenge long standing law on a women’s right to choose by overturning Roe v. Wade. Whether or not it is able to do so is another matter, but regardless, the balance of the court will make it so that women’s access to health care will be a harder road to toll, particularly with the administration’s attempts at overturning the Affordable Care Act. As to Bannon personally, in 1996 he was accused of domestic abuse. What of socialism? Is he even remotely one of these? The answer is by now quite apparent. Well, while Bannon claims that he is elevating the worker in his new vision of “economic nationalism,” epitomized in a “trillion dollar infrastructure plan,” this is not in any way close to something that will benefit the average American worker. Rather, as Greg Sargent explains “Trump’s [read Bannon’s] infrastructure plan won’t really amount to traditional government infrastructure spending backed by borrowing, but instead will be a scheme for awarding tax breaks to encourage private infrastructure projects.” And with the potential rollback of Dodd-Frank, this becomes even more pernicious because the entire plan is about privatizing infrastructure reform by providing big corporations able to undertake these massive projects with more tax breaks. 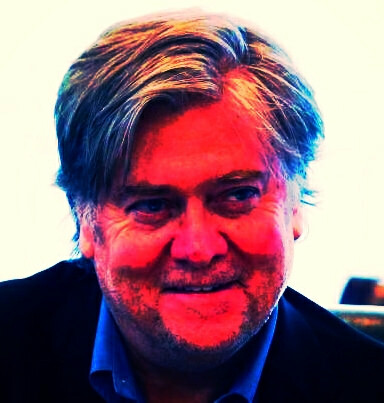 The ultimate reality is that Bannon is not a Leninist. He has an incoherent vision of the world that is shaped by a mishmash of views about the “average middle class” worker fighting against globalization, his own experience as a hegemonic capitalist at Goldman Sachs, bankrolling Biosphere 2, and producing alt right news and directing Hollywood films. Much like leaders in the past that misread some bit of political history or theory, attempting to merge this into their own experience, they come out misunderstanding not only the systems in which they live, but the changes they seek to make to those systems. The result is a dangerous set of incoherent beliefs. And, by cloaking himself in terms like “nationalist” or “Leninist” he seeks justification for these beliefs. Knowing that he seeks to justify this agenda by reaching into the past may enable one to surmise that he is not as powerful as he sets himself out to be. True power, according to Nietzsche, is when one rises above the need for justification or authorization. One becomes one’s “own categorical imperative.” Thus Bannon’s vision of “disruption” and “chaos” is as philistine as his understanding of the historical figures he cites. Though he may say, “I am, Thomas Cromwell in the court of the Tudors.” He fails to see the irony in his comparison. Cromwell did not read the mood of the people, and when he dissolved the abbeys, privatized the grazing lands, and feuded with the nobles, he created enemies in all those around him. The only person he had succor in was the king. Yet even that did not last. The more Bannon engages in similar acts and policies, he will alienate not only the “workers” he seeks to protect, but the wealthy too. All that will be left is Trump, and we have all seen how fickle he can be. If the left is going to be able to fight back against Bannon and the Trump administration it needs to understand two very important things. First, they see policy, norms, and the truth as disposable. They may be useful for a time, but they are not bound by them in any sense. The more the left rails that “this is not normal” the more they deliver to Bannon’s coffers. Of course it isn’t normal; he doesn’t want normal. To counter against it, one must not only come back with the truth, the law and society’s accepted and entrenched normative structures, but to also use the same tools of spectacle against Trump and Bannon. Bannon sees the media as “myopic,” and not focusing on what is really going on in the “real world.” If this is so, then we need to shift positions. More investigative reporting, and less giving in to the tweet storms and false flags. Without spectacle, they have nothing.